I bought a pair of these from Freewheel in Leeds around 1990 for Â£65. They were great, wished I still had them......actually, I suspect I do. My M210's are still going, Shimano shoes are awesome! Is there anyone that had SPDs BITD that didn't have a pair of these? Loved them, rode them until they fell apart and then I turned them into some SPD sandles. Bought Sidi Dominators after that and have used Sidis ever since, until this year when my wife bought me some 'casual' Shimano shoes for wearing on rides with her and I have to say that now, even when I'm doing a 'proper' ride, I reach for the Shimanos rather than the Sidis. yep had some M100, and sidi, which were too small (no one told me about the stupid mini sizing..) then some of the black/orange M200 which were just great shoes. I used to use Shimano shoes, then I switched to Sidis after two pairs of M110s lost their soles quite quickly. I have broad feet, but strangely find Sidi shoes to be the best fit. To get enough width in Shimano I always had to have about 1/2 size too much length in the shoe. Strange. Still on my first pair of M110s, no problem with the soles. Comfy as anything, too. Ya yes, I had the M100 shoes, Suntour XC-Pro pedals (with Power Grips) Bullseye cranks all on a Boulder Intrepid. They were the only Shimano products I owned (everything else was Suntour and Campag) - I was way ahead of the times then! 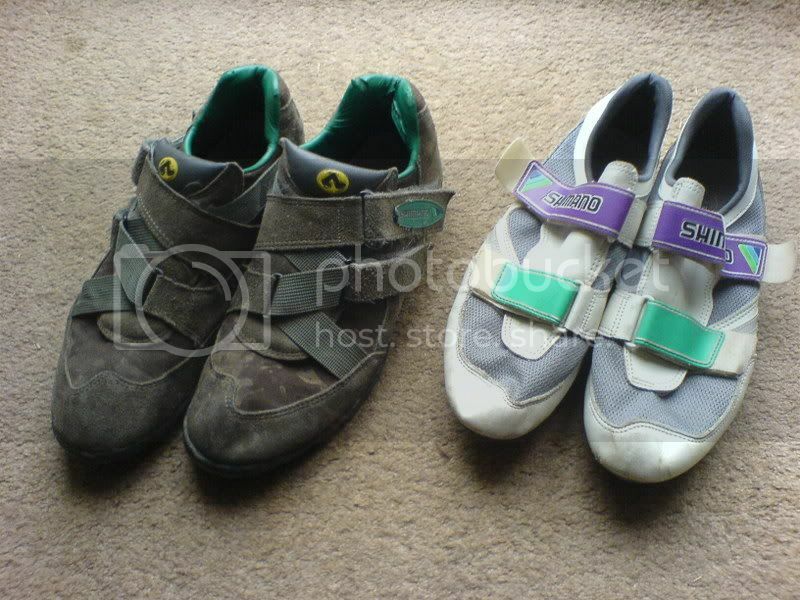 I had 2 pairs of those original M100 shoes then when the 2nd pair died, I could find nothing in the (then) current range of Shimano shoes that didn't look utterly ridiculous on you when you were off the bike. Was a shame because I felt that their shoes fitted me really well. Finally Shimano saw sense and brought out the M090s which so far have found the best cycling shoes ever. Also managed to pick up a pair of road shoes with recessed cleats for little money.